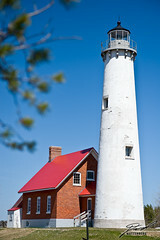 On our way to the "3rd Annual Spring Fling on Mackinac Island" we stopped by the Tawas Point Lighthouse for a few quick photos and a nearby Earthcache. On our way back from the walk (a very cold walk with the blowing wind) the lighthouse reappeared through the spare trees. The bright spire could not have been missed in the stark light of early afternoon.